The French dramatist Molière was the master of French comedy. His plays often attacked hypocrisy (pretending to possess qualities one does not actually have). He also directed, acted, and managed theater groups. 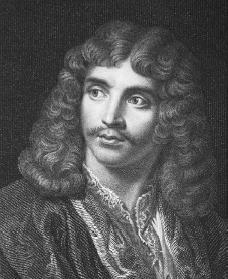 Molière was born Jean Baptiste Poquelin in Paris, France, on January 15, 1622. His father was a successful upholsterer (one who puts soft coverings on chairs) who held the post of official furnisher at the royal court. Molière had been attracted to the theater since childhood. When Tiberio Fiorelli (called Scaramouche), an Italian actor, came to Paris in 1640, Molière struck up a friendship with him. Molière was educated at the Collège de Clermont, a Jesuit (Catholic order devoted to educational work) institution. There he received a solid classical background, and he may have known some future freethinkers, such as the dramatist Cyrano de Bergerac (1619–1655). After finishing his secondary education, Molière studied law briefly and was allowed to practice in 1641. Molière was expected to take over the post his father held, but in 1643 he decided to devote himself to the theater. He had met a young actress, Madeleine Béjart, with whom he was to be associated until her death in 1672. Since the theater life was not considered very respectable, he assumed the name "Molière" in order to spare embarrassment to his family. He joined a troupe known as the Illustre Théâtre that included Béjart and her family. By 1644, having served two prison terms as a result of the company's debts, Molière joined another company with the Béjarts and toured all over France for the next thirteen years. In 1650 Molière became the head of the troupe, and he managed to secure the patronage (support) of the Prince of Conti. XIV (1638–1715) in 1658, it was Molière's comedy, Le Docteur amoureux, that most amused the king. The king's brother became patron (supporter) of the troupe, and Molière returned to Paris, the city of his birth. In December 1662 Molière presented a comedy, L'École des femmes, before the king. It was to be his greatest success. The play centers around Arnolphe, a middle-class man who chooses a child for his bride, whom he then raises in total ignorance. A young rival, unaware of Arnolphe's identity, tells him exactly how he plans to steal the girl from under his nose. The play caused a huge protest, known as the "Quarrel of L'École des femmes. " Molière's enemies, jealous of the king's favor toward him, attacked him as immoral and claimed he had stolen the story from another writer. Molière chose to answer his enemies in the form of a play. His Critique de l'École des femmes, presented in June 1663, included a discussion on stage of both the critics and the criticisms. The "Quarrel" served to establish comedy as an accepted form of literature. In May 1664 Molière was invited to perform Tartuffe ou l'Imposteur, an attack on religious hypocrisy, for Louis XIV at Versailles, France. The play angered the Society of the Holy Sacrament, a powerful religious group, and for five long years Molière struggled without success for the right to perform his play. Finally, in 1669, the power of the Society had lessened, and Tartuffe was revived with great success at the Palais Royal. Dom Juan, first presented in February 1665, is considered one of Molière's greatest plays, although it was not published until after his death and remained almost unknown until the twentieth century. Although Molière enjoyed the personal support of the king, he struggled with illness, marital problems, and depression. Still, during this period he wrote and presented a work that shows his mastery and genius. Le Misanthrope, presented in June 1666, pleased his admirers, but it lacked the popular appeal necessary to make it a success. L'Avare, presented two years later, failed miserably, and Molière faced extreme financial (related to money) problems. A comedy-ballet, Le Bourgeois gentilhomme (1670), helped bring in the public once again. Molière had also developed a bad cough, which he tried to mask as a comic device. When overcome by a coughing spell onstage, he exaggerated it in an attempt to make the audience laugh. The condition worsened greatly, but Molière had little faith in medicine. In 1671 Les Fourberies de Scapin, a bright comedy similar to his early works, was presented. On February 17, 1673, during the fourth performance of his last work, Le Malade imaginaire, Molière began having seizures. He died that same night, attended only by two nuns, having been refused the right to see a priest. Bermel, Albert. Molière's Theatrical Bounty: A New View of the Plays. Carbondale: Southern Illinois University Press, 1990. Bulgakov, Mikhail. The Life of Monsieur de Molière. New York: Funk & Wagnalls, 1970. Reprint, New York: New Directions, 1986. Scott, Virginia. Molière: A Theatrical Life. Cambridge, Eng. : Cambridge University Press, 2000.